The adrenaline of the DC-3 flight carried me through the rest of the day. Like a love-struck girl, I walked around in a daze after, smiling at no one and everyone. I’m sure I looked crazy, but I didn’t care. If I could have found a flowery meadow to spend the remainder of my day alternating between twirling in and laying in, I would have been in Heaven. But every inch of grass was taken by planes, spectators and campsites. A fun site I discovered strolling through Camp Scholler. I decided instead to reach out to some others I knew were at the event, but hadn’t had the pleasure yet to meet – the editors of Plane & Pilot (I’ve written a couple pieces for them). Having missed my lunch with Women Venture, my stomach was growling and, as luck would have it, Robert Goyer, Editor-In-Chief of the magazine, had just scored some free food. Sweeeeet! We had a lovely meetup and Robert showered me with wonderful compliments about my writing. It was nice to hear such praise from someone like him. When you have two young kids, work full time and juggle an aviation addiction on top of it all, you are lucky when you can string a single thought together let alone multiple words. After lunch, I started an aimless wander. The sun, which had been mostly hiding that day, had peaked out just enough to start toasting my skin. Sweat began to form and my lips began to parch. Knowing the signs of dehydration far too well – I used to work outside all day as an Archaeologist, I knew it was imperative that I find a cold beverage sooner than later. Beer seemed the smart choice. I had heard legends of a place called “The Beer Tent.” I wasn’t sure why it was famous and I didn’t care, but I liked its name and followed the giant yellow ball floating over it until I found its location. It didn’t take long for me to note why the place had gained such elevated status among men, and it had nothing to do with the beer. “That’s trashy,” he responded, quickly googling directions to the tent. Since I had such great luck after reaching out to my last two contacts – scoring both a fun ride and a free meal, I decided to see if three times would be a charm. So, I messaged a couple pilot friends I moderate a Facebook group with and, as it turned out, one of them was not only at OSH, but also close enough to pop over. David is a young guy in his early twenties who has gained more flight experience in his short time than most pilots 2-3 times his age. He has around 4,000 hours of flight time, much of it up in Alaska flying in situations the rest of us would probably soil our underwear in. Not sure what exactly he does, but I know it involves transporting things… legal things I assume, but I don’t ask too many questions. But in a very loving way. The best part about the guy is that he can tell a story about paint drying and have an entire room laughing so hard they are brought to tears. It didn’t take long after he rolled in; The stories started and the Tent came to life. When it was time to leave, there was a crowd around us. Honestly, I could have just hung there for the rest of the evening and called it a day, but both of us had been invited a while back to a party in the North 40 called the “H.O.P.S. Party,” an annual gathering hosted by Jay Honeck, owner of Amelia’s Landing Hotel. In exchange for a free meal, attendees are asked to bring a six pack of brew from wherever it is they hail from. It sounded like a good time, plus I’d get to meet some others from the online pilot world. This party was pretty far away from our current location and I was exhausted. Thankfully, it turned out that David had access to some kind of Chinese knockoff version of a dirt bike. Most of the parts still appeared to be attached, so I figured it was safe enough. I hopped on the back and away we rode to the next adventure. It was a fun get-together, but at some point the weather turned from the blue skies you see in the picture above to the torrential downpour in the one below. That, apparently, is the nature of Oshkosh. By the time the rain fell, fatigue had already won its battle and it didn’t even dawn on me to move my bookbag to higher ground. The next morning I found my logbook, my precious precious logbook… the one that features signatures of many great people such as the still-handsome Harrison Ford… saturated. There was no denying it. I had two choices – freak out and start crying over wet paper, or smile (through my apparent hangover) at the mark that would eventually dry, but forever remind me of my first Oshkosh experience. After soothing my throbbing head with copious amounts of coffee and a plate full of syrup-smothered pancakes, I decided to catch the early bird special being offered at the Ford Tri-Motor tent. 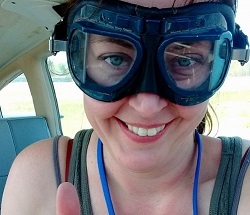 If anything could cure a hangover, a ride in an 80+ year old plane, dubbed the “Tin Goose,” could! It wasn’t as fun as maneuvering around in a DC-3, but it was still a damn good time with some pretty fantastic views. I spent most of Thursday casually strolling the grounds, admiring planes and ducking into talks or safety seminars whenever my feet tired. I was the nerd who sat in the front row asking all the questions, by the way. Sorry about that. I may not technically be a “student pilot” anymore, but I will forever be a student of piloting. Hard as I might try, though, I just couldn’t shake the IPAs from the night before and eventually decided to retreat back to camp. It was nice to just sit for a while, doing nothing beyond soaking in abundant sunshine and enjoying sounds from the sky. An older gentleman strolled by, saw my cold beverage and asked where he could find one himself. Before long, we were sitting side by side, talking life, family and flying. It was one of the most enjoyable conversations I had on the trip. He told me about how he used to be a pilot, but gave it up when his young daughter – 15 at the time – began to show interest in learning. He could only afford one pilot in the family, so decided to invest his money into her instead. At 16, she soloed. By 17, she was a private pilot. Before long, she’d be flying 747s and living the dream. By the time his daughter stopped over to say “hi,” I felt like I was meeting a hero. She certainly had a very proud dad. I told her what a delight it had been to chat with her father. What I didn’t tell her was how sharply my experience with him had contrasted with some of my other, less pleasant, interactions with men at the event. This was the only thing I did not enjoy about my experience. Sadly, it turned out that many men thought that my wanting to talk shop/planes with them equated to my wanting to sleep with them. Not once, but twice, did I have to remove myself from situations in which men thought it was OK to actually put their hands on me. I was starting to become hesitant to engage anyone other than women in conversation, so meeting this gentleman was a a very welcome experience. Later that evening, my best friend, who had recently relocated to Madison, WI with her husband, stopped by for an overnight visit. If there was ever a perfect place to catch up with an old friend, it was there… under the sea of a dazzling sunset, watching the Blue Angels play in the sky. Two Blue Angels can be seen at the top left. They were supposed to practice earlier in the day, but a taxiway incident (not clear on details) delayed their flight. Tomorrow the sun would rise, I’d say goodbye to my friend and begin the fourth day of my first Oshkosh experience. I was tired, but just as “Su” had promised, there were still many stories to be made, including one involving a dinner-crashing cameo by a famous astronaut! * While my logbook sadly did get soaked, the main reason I didn’t lose it was because it is backed up electronically. I greatly value my logbook and all its entries, but, to me, every entry and, yes, every mark on its pages, is its own story. And one I will forever treasure. This entry was posted in Aviation, Flying, Uncategorized and tagged Adventure, Air Force, airlines, Airport, AirVenture, Amelia's Landing, Aviation, Camp Scholler, ChicksFly, DC-3, EAA, EAA Airventure, Flight, Flying, Ford Tri-Motor, General Aviation, happiness, Happy, Life, Living, monkey, NASA, OSH, OSH17, Oshkosh, Plane & Pilot, SOS Tent, Women Venture, WomenVenture. Bookmark the permalink.